9th-ranked Texas remains alone at the top of Big 12 standings with an 8-1 record following a sweep on the road of Iowa State Wednesday. RV Baylor and Oklahoma are tied for third in the conference with 5-4 marks, also registering victories midweek. West Virginia picked up a win as well, downing Texas Tech in 4 sets for its second Big 12 win of the year. 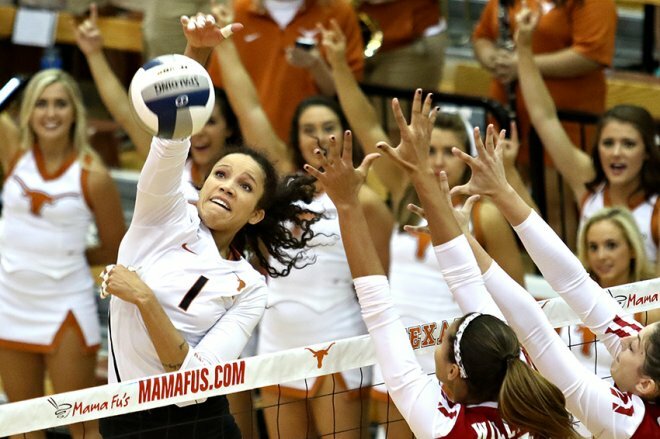 9th-ranked Texas cruised by Iowa State in straight sets on Wednesday in Ames, Iowa. The Longhorns were dominant throughout the match, topping the injury-ridden Cyclones with advantages in attack percentage (.364 to .129) and at the net (8 to 3). Baylor survived a tight 5-set road match at TCU to secure its fifth conference win of the season Wednesday night. The Lady Bears, who received votes in this week’s VolleyMob power rankings, used advantages in attack percentage (.227 to .172) and at the service line (7 to 3) to outlast the Horned Frogs. West Virginia overcame Texas Tech in 4 sets at home in Morgantown, W.Va., on Wednesday night to secure its second Big 12 win of the season. Despite trailing the Lady Raiders in attack percentage (.191 to .184), the Mountaineers claimed the victory with an 11 to 9 advantage on the block and a 5 to 3 edge at the service line. Oklahoma bested Kansas State in 4 sets on the road on Wednesday night to claim its fifth conference victory of the season. The Sooners used a season-high 19 blocks and a .256 to .120 attack percentage advantage to come out on top against the Wildcats. Friday, Oct. 26 Kansas State at Iowa State Ames, Iowa 8 p.m.
Saturday, Oct. 27 Kansas at Baylor Waco, Texas 1 p.m.
TCU at Texas Tech Lubbock, Texas 2 p.m.
Oklahoma at Texas Austin, Texas 4 p.m.